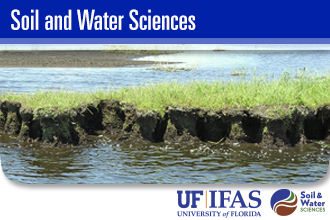 Dr. Julie Meyer has recently been appointed as a Research Assistant Professor in the Soil and Water Sciences Department with a specialty in Marine Microbial Ecology. We asked her a little about how her career has developed and what her future research goals are. At what point in your life did you know that you wanted to be a scientist? I feel like maybe I always knew that I wanted to be a scientist. I spent most of my childhood outdoors, running around barefoot, climbing trees, and picking wild berries. When I was in sixth grade, I remember a very specific natural history assignment (the choice of either an insect collection or a plant collection) that started me thinking about having a career that involved nature. I chose the plants and by the time I reached high school, I could identify most of the wildflowers and many of the trees where I lived, as well as spot wild asparagus. As a teenager, I was the only member of the local chapter of the Maryland Ornithological Society under the age of 40. A steady diet of field guides prepared me well for my early jobs as a naturalist in state parks, even as I trained for a career in ecological research. I often still feel like that kid running around outside, but now I get to apply that excitement to understanding and solving problems in the natural world. Can you tell us a little about your road to UF? I’ve spent most of my life living on peninsulas, so it is no wonder that my career has revolved around water. Most of my childhood was spent on the Eastern Shore of Maryland, on the banks of the Chesapeake Bay. Later, I earned my PhD in Marine Biosciences at the Lewes campus of the University of Delaware, situated at the mouth of the Delaware Bay. After completing my graduate studies, I was a postdoc at the Marine Biological Lab on Cape Cod. Both my PhD and first postdoc involved the study of deep-sea microbiology, which included five incredible research expeditions at sea. On the East Pacific Rise (west of Costa Rica), I had the chance to dive in the Alvin submersible to a depth of a mile and half below the surface of the ocean and see hydrothermal vents up close. 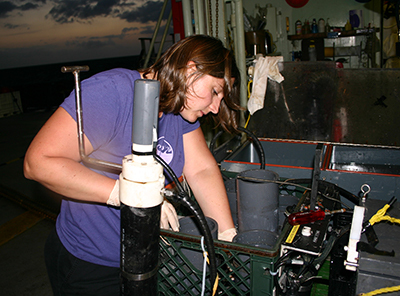 Dr. Julie Meyer on a deep-sea research expedition, setting up sampling equipment that will go down on the Alvin submersible. On the Mariana Arc (off the coast of Guam), I witnessed volcanic explosions on the seafloor in real time, where the ground pulsed and expanded during the eruption and specks of molten sulfur could be seen in the plumes of gas escaping the seafloor. Videos of these eruptions are available on the blog for this research cruise. I also took part in a research expedition to find new hydrothermal vents along the Cayman Trough. We didn’t find the vents themselves on our cruise, but we detected traces of three different plumes and that information was later used to find some of the deepest hydrothermal vents ever discovered, at nearly 3 miles below the ocean surface. While deep-sea microbiology is exciting, much of it is exploratory, very expensive, and high-risk. When I came to the University of Florida, I switched my focus to the microbiology of coral reefs, where I can more easily collect samples and answer questions about the complex interactions between microbes and their hosts. Although the samples that I work with now are very different from deep-sea fluids and biofilms, many of the techniques and tools that I use to analyze the samples are similar. You were a recipient of the L’Oréal For Women in Science postdoctoral fellowship award in 2015. How has that impacted your career or helped you to serve as a role model for young women with an interest in studying science? The L’Oréal For Women in Science fellowship really helped push my career to the next level. The funding allowed me to get training as a science diver and set my own research objectives. I also received training on how to talk to the press, which has since propelled me to continually practice and refine my science communication skills, including starting a blog about my research. As part of the fellowship, I interviewed a dozen Florida women in marine science, including students and faculty at the University of Florida and the University of South Florida. I used these interviews to develop a short documentary to encourage young women to pursue careers in science, with the goal of providing role models of a variety of backgrounds. It is thought that “you can’t be what you don’t see”. My hope is that young women will see someone like themselves in the film and imagine themselves as a scientist. The documentary is available online and will be presented to local students. What is your vision for your future research programs? Black Band Disease on Pseudodiploria strigosa brain coral, Carrie Bow Cay, Belize. Photo by Max Teplitski. I have been investigating the microbiology of coral diseases like Black Band Disease since I came to UF as a postdoc. I am now expanding my research program to more systematically investigate the role of coral microbiomes in the functioning of healthy reefs and in coral restoration. Florida’s coral reefs have declined substantially since the 1960s, in response to diseases, bleaching events, and both direct and indirect pressures from the increasing human populations on Florida’s coasts. 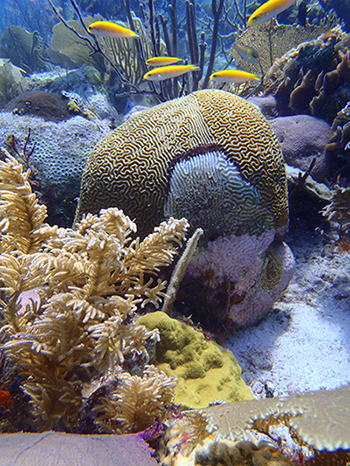 However, tremendous multi-agency efforts are currently ongoing to restore Florida’s reefs by planting nursery-reared corals in many locations in the Florida Keys National Marine Sanctuary. 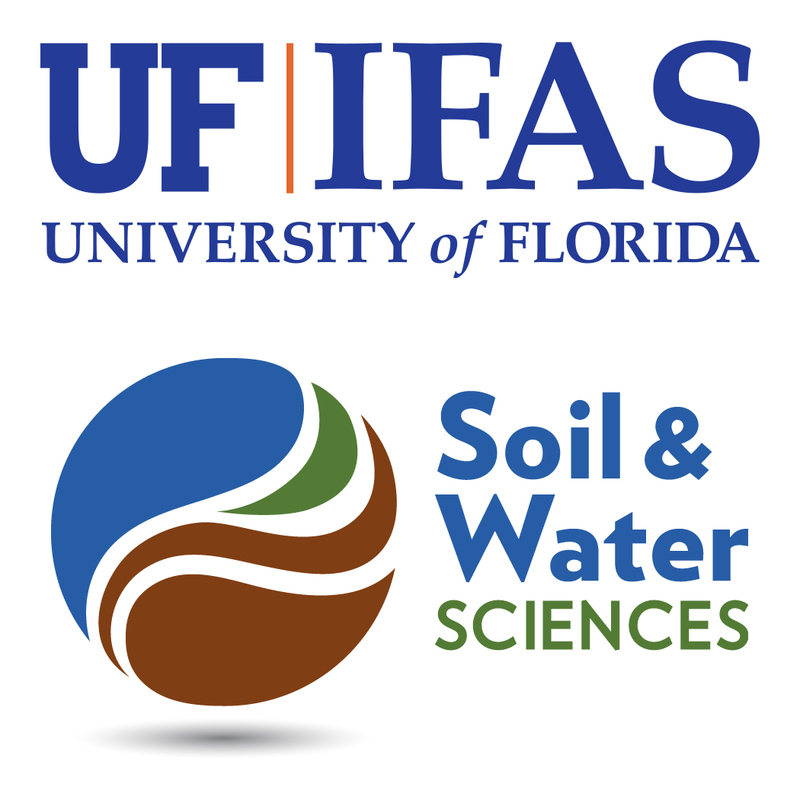 Here at UF, I have the opportunity to collaborate with other faculty involved in the restoration efforts to uncover the role that microbes play in the long-term success of restoration projects.